Smart devices gain corporate stature: wearable tech next? 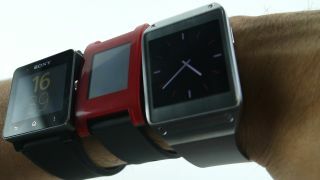 Will smartwatches soon be sharing the workload with smartphones and tablets? So, employees are using multiple screens to get their jobs done, making use of PCs, tablets, and smartphones, and they don't necessarily care whether that device is personally or corporate owned. Having their tools, applications, and services available so that they can work wherever is convenient is the most important issue: multi-screening means that people are no longer tethered to their desk. Employees are increasingly gaining the power to choose the right device for the right job, at the right time, in the right place. Further evidence of this multi-screening trend can be seen in the Ovum survey data taken specifically from workers who have been given three types of device by their employer: a PC, a tablet and a smartphone. Having these corporate-provided devices indicates that they are largely the primary such device used for work by that employee, even if they also use their own occasionally. Ovum's study shows the amount of time spent working on applications on these different devices is remarkably evenly spread, contrary to the idea that the PC is the primary computing tool used at work and minimal time is spent on smartphones and tablets. We've found that while laptop usage is slightly higher across most applications, people spend a significant amount of time on smaller devices. Even on Office applications such as word processors and spreadsheets, where laptops might be expected to dominate time spend, around 33% of respondents spent half an hour or more per day using these applications on a smartphone or a tablet (versus 43% spending that amount of time on a laptop) . The laptop is not necessarily being replaced by tablets or smartphones, but they are increasingly important, complementary devices. New types of devices and form factors are also now adding a little extra complexity to this situation, adding capabilities for users. Hybrid or convertible tablet / laptops go some way toward making tablets a realistic replacement for laptops, as they combine the touch screen, ease of use and portability of a tablet with the processing power and performance of a PC. While the early models of these types of devices have some limitations and appeared to be a little too much of a compromise between tablet and PC, the genre is developing quickly and we are already starting to see cases where workers are able to abandon their laptops in favour of these more flexible and lightweight hybrid devices. At the same time, Machine to Machine (M2M) technology and the internet of things is enabling a new market for wearable devices to take off in the consumer space. While there are no mainstream productivity applications yet in place for smart watches such as Samsung Gear, sensors such as Jawbone, or heads-up displays such as Google Glass (any applications in existence have very niche use cases) it can be expected that applications will be found in the workplace. Just as smartphones, tablets and mobile apps all reached a mass consumer market before finding importance in the workplace, the same can be expected of wearables over the coming years. Richard Absalom is a Senior Analyst of Enterprise Mobility and Adrian Drury a Consulting Director, both at Ovum. The Future of Work report was produced in partnership with Samsung - follow the links for Part 1, Part 3 and Part 4.